If you happen to be at our house on a Sunday during the fall season, you can expect to be served some fattening football food. This posting is more of a technique than it is a recipe because these pizzas can be customized in a variety of ways. 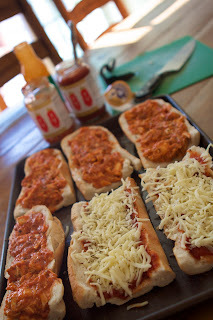 Last week, we served up some buffalo chicken french bread pizzas and plain cheese ones for the kiddoes. Here is our recipe for buffalo chicken french bread pizzas! Copyright © PrepAhead and Dine In: prep ahead football food: stuffed french bread pizzas. All Rights Reserved.